Taste test: These are fairly thin potato chips with a very nice ranch taste. 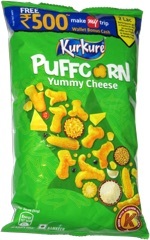 They're good and quite tasty, but they could stand to be a little bit crisper. 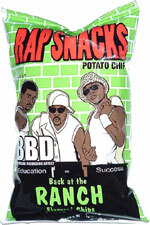 Some of the other Rap Snacks that I tried (in particular, the Hot Cheddar ones) combined great flavor with a high level of crispness for an amazing chip, but the moisture content of these is noticeably higher, making the overall experience just a bit below optimal. Smell test: Nice, mostly potatoey, just a hint of ranch.